We’ll be discussing the foam materials and manufacturing capabilities we leverage to produce high-quality die cut foam solutions, as well as performing some demos to give you a better understanding of various materials. 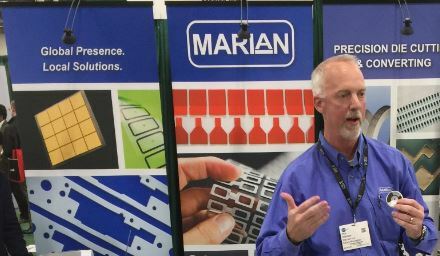 Don’t miss an opportunity to see examples of Marian’s capabilities and connect with our material experts. We’ll be demoing our solutions to sound/vibration damping and shock absorption, as well explaining an array of important foam properties such as: compression force deflection, compression set resistance, thermal resistance, and thermal conductivity. Take a look at Marian’s Thermally Conductive and Resistant Foam Sponge Demo from last year’s show.